Brawlout Nintendo Switch Trailer | Nerd Much? For those of us waiting for Nintendo to just announce a Smash Bros.
Brawlout has been on PC since April of this year, and though it did fairly well there, it will explode on the Nintendo Switch. For those of us waiting for Nintendo to just announce a Smash Bros. for the new console, Brawlout is sure to scratch that itch. As you might have guessed, Brawlout is an arena fighting game with plenty of characters with a huge range of abilities. The two featured in the trailer are The Drifter from Hyper Light Drifter, and Juan from Guacamelee. The Drifter’s abilities include Prism Shield, Slash Dash, Pistol Shot, Dash Strike, Jump Slash, and Falling Slice. All fairly standard for the sword wielding character, save for the Pistol Shot. Juan’s skills are also reflective of what he has in his own game, such us Rooster Uppercut, Dashing Derderp, Olmec’s Headbutt, Pollo Power, Frog Slam, Grapple, and Throw. The rest of the characters in Brawlout are, I believe, original creations for the game by the developers Angry Mob Games. The game also includes something called a Rage Meter, which is just as it sounds, it builds as time passes regardless of how many hits you take or make. The screen turns red and the Rage Burst allows the players to push their opponents back, breaking shields and combos. This allows the player to get a few hits in or stop a death blow just in time. 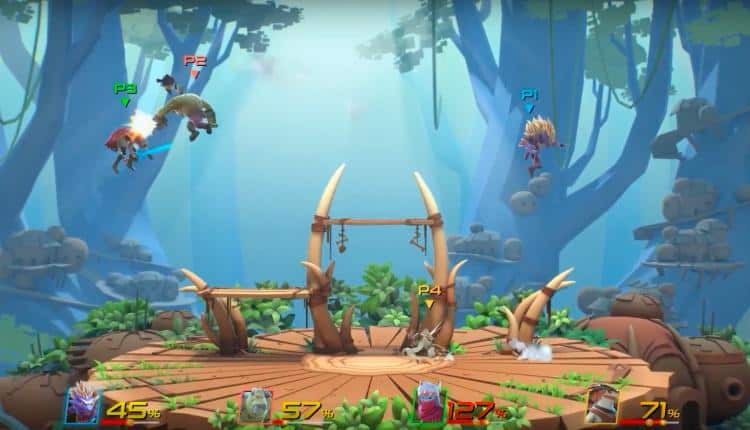 As with all brawlers, Brawlout has single player and multiplayer modes. Single player is mostly training levels and challenges in the Arcade Towers, all against AIs. Multiplayer can be done both online and offline for the Switch, using any of the Switch controllers in any combination. You can also play across devices for those that want to play with more than two people in undocked mode. Brawlout comes out on the Switch December 19, 2017. Do you think Brawlout has the potential to be as good as Smash Bros. for the Switch? Let us know in the comments below what you think.